At my last general eye exam, I was asked if I wanted the retinal exam that didn't require my eyes to be dilated. Not knowing that there are many benefits to this test, besides not being able to see in bright light for several hours, I declined. The next time I will answer yes. 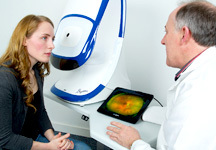 Dilated eye exams allow your eye doctor to see the back of your eye ... the retina, but only about 15% of it at one time. During this exam, blood vessels can be seen without any kind of invasive procedure. There are many things an eye doctor can learn about a patient's health from this simple retinal test from diagnosing eye diseases to detecting diabetes and high blood pressure. However there is a fairly new technology that doesn't require the eyes to be dilated and allows the eye doctor to see a wider field of view - 80% compared to the traditional 15%. Find out what this test is, how easy it is to perform, and what the benefits are to you for diagnosing and monitoring your eye disease.